Former racehorse trainer Patti Shirley established the Equine Encore Foundation in 2005 in Tucson, AZ, as a provider of a safe haven for successful racehorses after they leave the racetrack in the form of a new career or a dignified retirement. The foundation primarily provides permanent retirement homes for racehorses rather than offering horses for adoption. Shirley began Equine Encore almost by accident when she was interviewed in the Sunland Park winner’s circle after winning a stakes race. “I just mentioned how something needed to be done to care for these horses when they are finished racing,” said Shirley who used her interview as a platform to get the word out on a topic she is fiercely passionate about. 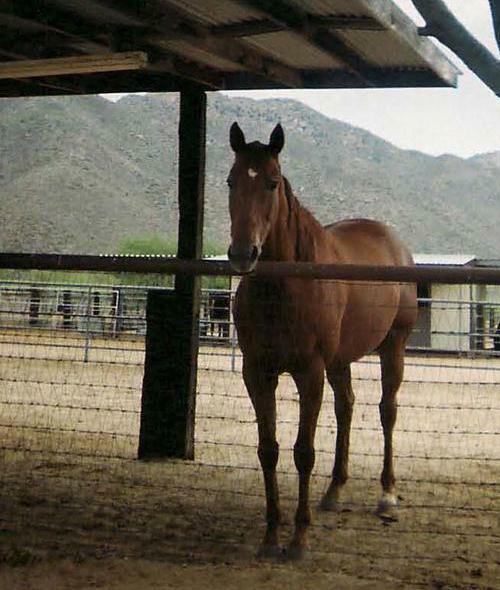 Within a short amount of time, Shirley received a call from a fellow trainer who “had a horse for her.” With plenty of room on her farm in Tucson, she took the retired racehorse, and then quickly began seeking advice about how to begin a non-profit equine retirement organization. More horses soon followed, and Equine Encore now cares for 70 horses (two are Quarter Horses and the others are Thoroughbreds). Equine Encore categorizes itself more as a sanctuary than an adoption faculty. Although they adopted out three horses last year, most of the horses on the farm cannot be safely re-trained due to injury or age. However, this doesn’t bother Shirley who prefers this equine population. “These are the ones I really care about,” said Shirley who mentioned many people cannot afford to pay for just a “pasture pal” anymore. “They’ve earned their money,” she said about giving a proper retirement to the racehorses. As with many equine facilities, hay is the largest expense for the organization. The grant funds awarded by TCA directly help lower the feed bill. Although there is physical room on the farm to accommodate more horses, until funding increases, Shirley is unable to accept more horses at this time. However, Shirley plans to explore a foster care system in the future along with a long term goal of providing tours to raise awareness of the need for equine retirement facilities, which Shirley sites as one of the biggest challenges in her field. “People have no idea the problem horses encounter when leaving the racetrack,” said Shirley. As far as her greatest success with Equine Encore, Shirley said, “Everyday is a success when you visit the horses.” TCA is proud to support such a success.